In the library, there are technologies hiding behind the scenes to make the catalog work. Some are “soft” technologies that individuals implement instead the hard technologies used by a computer crunching data to fulfill a user’s search. These soft technologies give rules for organizing the cataloging information about a resource. When there were only card catalogs, the product of these technologies were visible, but not the rules used to make them. Now, even the soft technologies are behind-the-scenes. 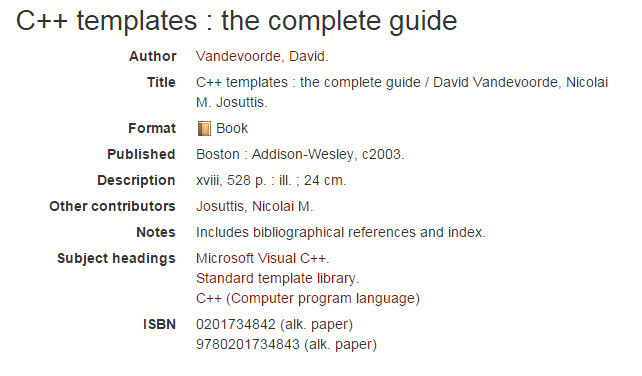 This Cataloging-in-Publication information helps librarians add the book’s information to a catalog. This text is similar to what one would have found in a card catalog. The Library of Congress is involved in preparing this summary. The whole purpose of the textual format is to meet the needs of library users. Some tasks that the catalog helps include: Can the users find whether their library contains a copy of the resource (e.g. book) if they know the author or title? Can they find other works by the same author? Can they find where the resource is in their library? The first soft technology that this is based on is AACR2 – the Anglo-American Cataloguing Rules, second edition. Resource Description and Access (RDA) is the current state of evolution of this standard. AACR is older than many online tools so that it omits information that wouldn’t fit on a library catalog card. Now the card’s size doesn’t have to limit what may be included now in RDA data..
An additional soft technology is formed by the International Standard Bibligraphic Description (ISBD). AACR2 and ISBD define the order of the different pieces of information. They also specifies the punctuation to use in different places. AACR2 also defines where to look on a resource to find the information. Some information should be from the title page or reverse of the title page. Some can come from anywhere. Later, this textual data is massaged into a form convenient for the computer to search. The formatting is a hard technology containing detailed rules for every aspect of the record. This more detailed representation helps software search the catalog. The online catalog uses this technically precise information and presents it to the users in a form that the users can understand. Each cataloging system presents the information in different styles. If you look for this book in different libraries, you will see different text from each service. You can see most of the information from above in this clip from Indiana University’s catalog. The most obvious difference is that the catalog has the size and page counts which the Cataloging in Publication information did not. The book hadn’t been printed before the Library of Congress created the record so that it is missing page counts and sizes. Also, the Cataloging-in-Publication data doesn’t contain information about the publisher. The process of cataloging is very detail oriented and, when done well, is completely invisible.